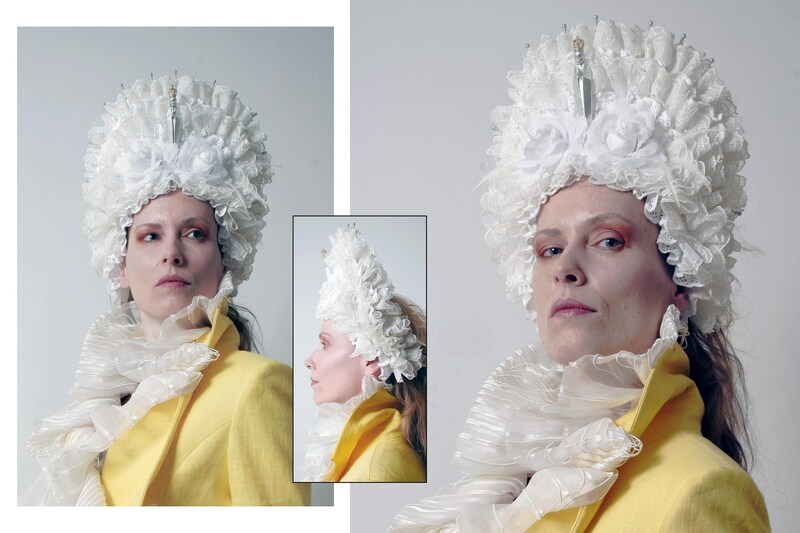 This hand made Headdress by costume designer and visual artist Ingeborg Steenhorst is inspired on historical paintings of English Queen Elizabeth I (1533 - 1603). The headdress is inspired on the famous portraits of the queen in which she is dressed with pearls and a large lace collars. Pearls, said to be her favorite jewel, symbolize virginity. As a display of her purity, virtuousness, and even agelessness, the pearls would have reminded her subjects that she was “married” to them. The extravagant and delicate white lace collar also refers to her virginity. As a gimmick Ingeborg turned the lace collar into a large lace ruffle headdress with pearl beads and a silver plated 'Virgin Mary wood sculpture as centre piece.